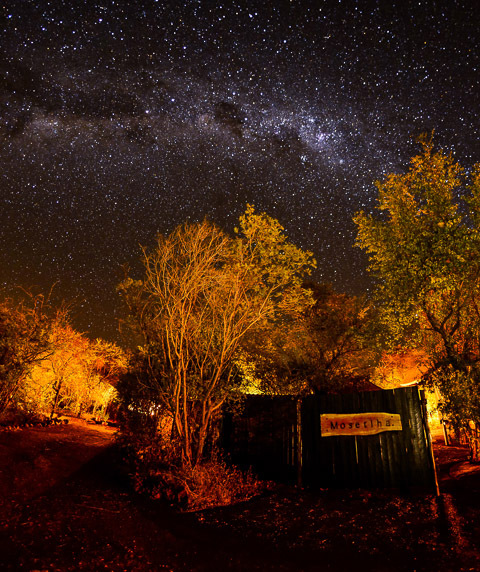 Mosetlha Bush Camp is situated just 3 hours’ drive from Johannesburg via Sun City in the very heart of the magnificent Madikwe Game Reserve. 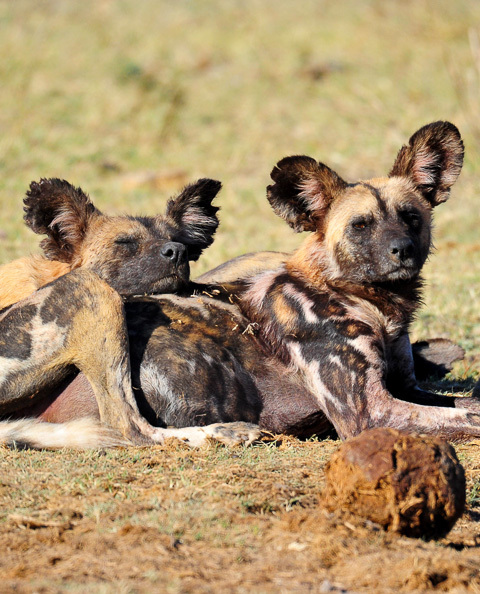 Enter at either at the Molatedi Gate (if approaching from Sun City) or the Abjaterskop Gate (if approaching from Zeerust/Mafikeng) then head toward the parks administration building where you will park your car and be met by your Mosetlha Field Guide. 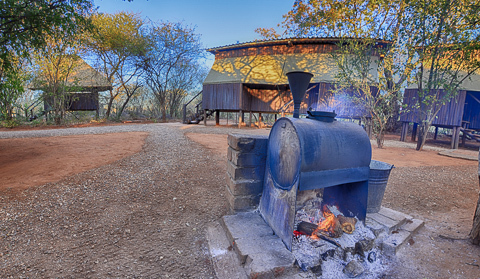 Mosetlha is truly a unique wilderness experience and is the only genuine rustic eco lodge in Madikwe. It is owner run - Caroline (owner’s daughter) greeted us warmly then gave us a tour of the camp and explained how everything works. 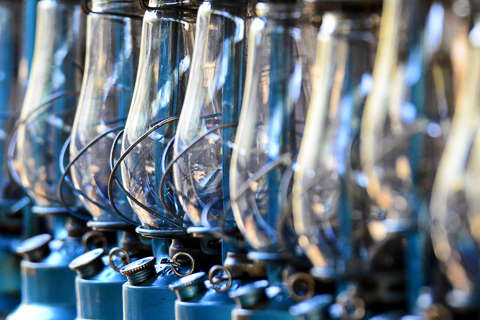 The simplicity of the camp is very refreshing with no mod cons such as electrical power or running water – at night paraffin lamps and solar powered lanterns give off the soft light that is needed to find your way round. 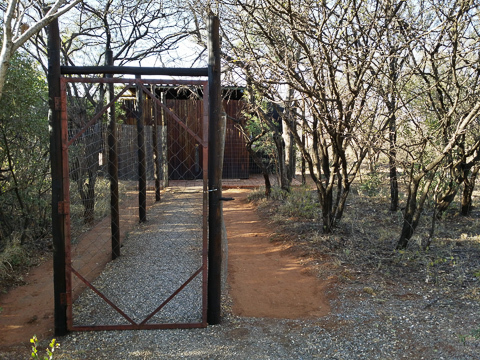 The camp, while unfenced is very safe to walk around and blends well with the surrounding bush. 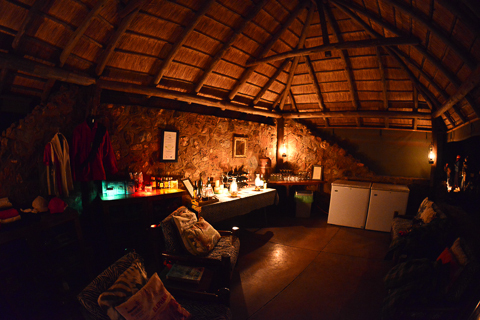 A large lapa-type lounge and curio shop are under thatch next to the dining area. 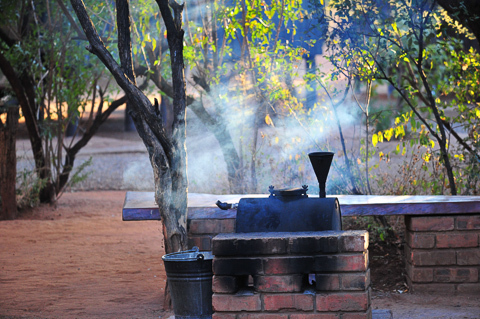 Meals are served in the dining area around a large table that is shared with the other guests - all our meals were well prepared in true bush style fashion on the open fire. 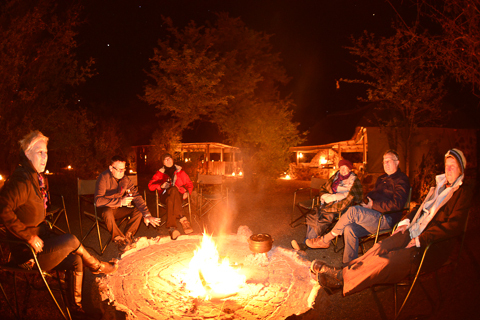 After your afternoon game drive and just before dinner it is nice to sit round the boma fire sharing stories of what was seen during the day. Tea, coffee, fruit juice, rusks and snacks are offered throughout the day in the dining area. 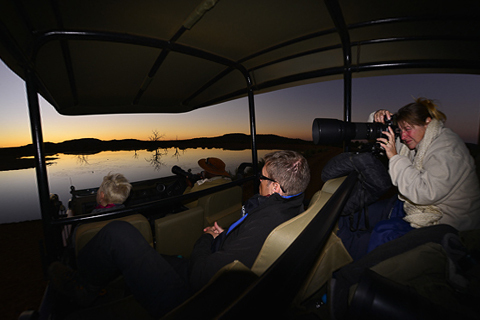 A mini breakfast is put out before the morning game drive and this consists of – rusks, fruit, cereal, tea and coffee. 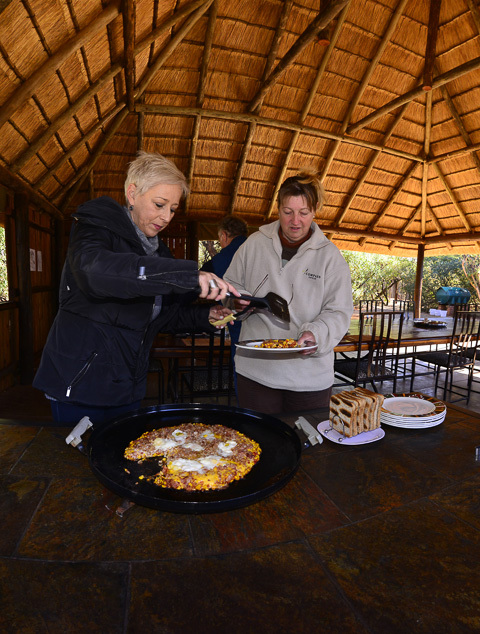 Then the main breakfast is served on returning from your morning game drive- every day offers a different treat like their famous Mosetlha griddle breakfast. Lunch/tea is served just before going out on your afternoon drive, and that could be a hamburger with salad or soups during those cold winter days. 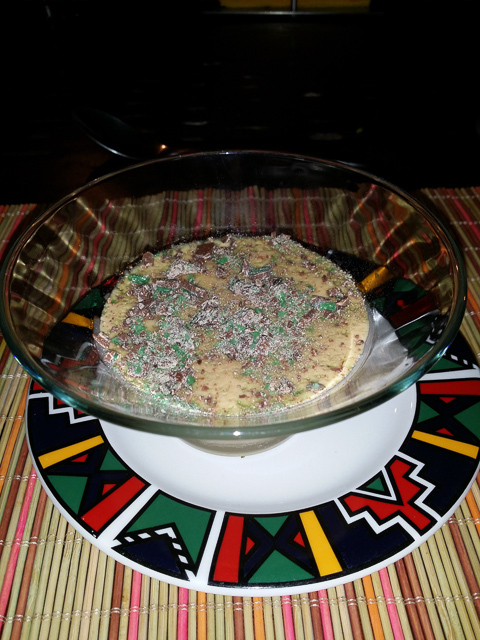 For dinner we had beef potjie pot rice and salad, with a lovely peppermint and caramel tart. The bar, which is next to the lounge in the lapa, is an honesty bar with a large selection of wines, beers and other drinks. Fresh filtered water is on tap in the bar or you can buy bottled water. 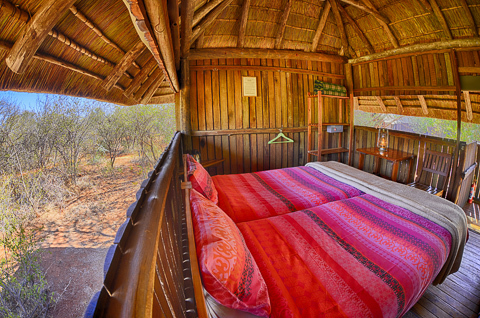 There are 9 rustic raised wooden cabins set amongst natural bush surrounding the camp’s central area. There are two sets of cabins that are joined making it great for families while the others are free standing. The cabins are partly open on the sides with canvas flaps that are lowered at night. 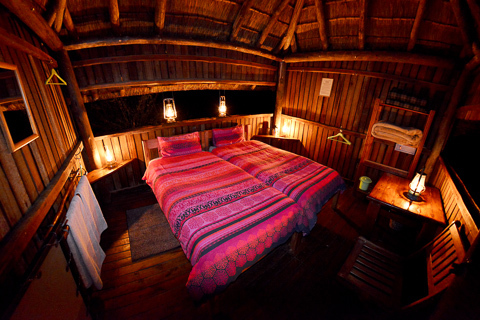 Each cabin has twin beds, two potties, a large bowl for washing your face, towels, fresh water and glasses plus a small safe. Beds are made up with duvet covers and during those cold winter months a hot water bottle is on offer. 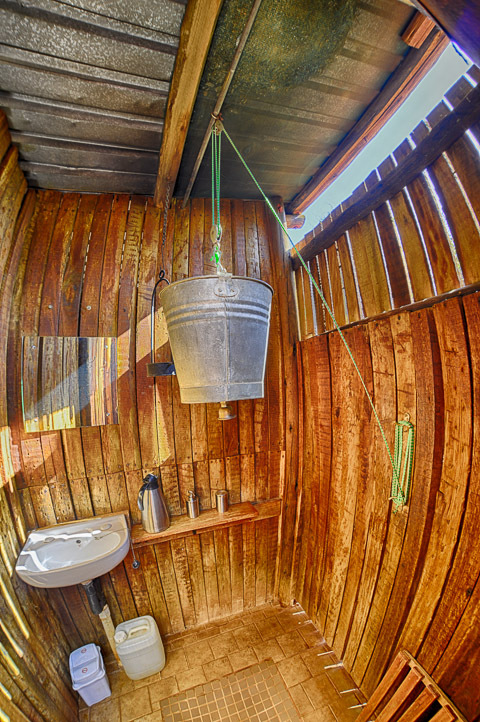 then the hot water is taken from the donkey to the bucket which you fill and now your hot shower is ready! A bowl and jug of water is provided for washing your face and brushing of teeth. Everything is well thought out for both practicality and your comfort. 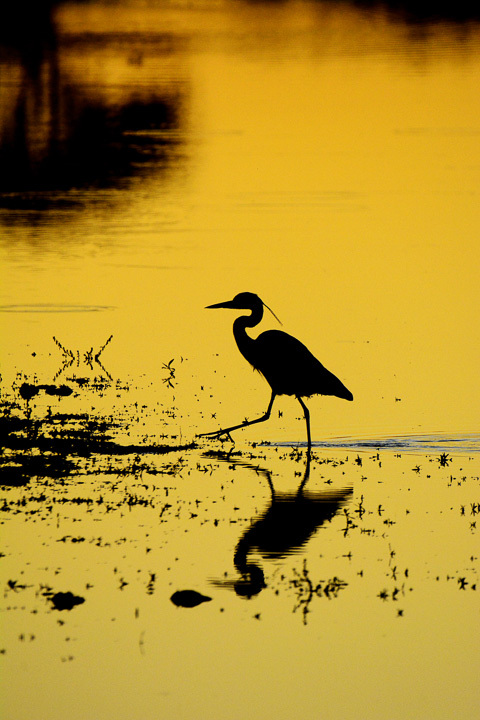 There are about 4 birdbaths in and around the camp allowing you a chance of seeing the many different bird species that come to bath or drink. 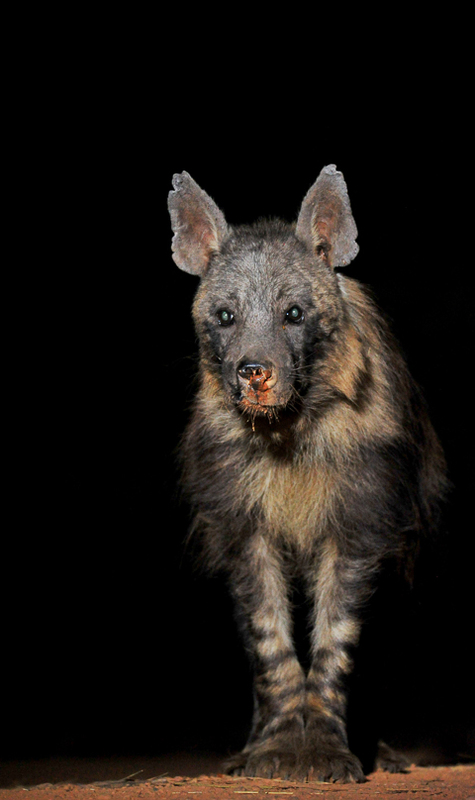 At night a few dagga boys (old buffalo bulls) Barnabus and Sabastian pop in for a drink as well as Cyril the civet and Harry the brown hyena. 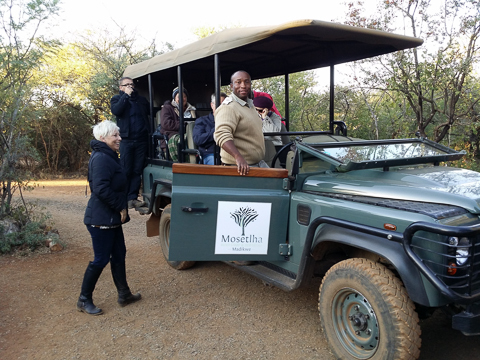 Both morning and afternoon game drives are on offer as well as guided walks. We had a great time with our guide Johnny who showed us so much during our 3 day stay. 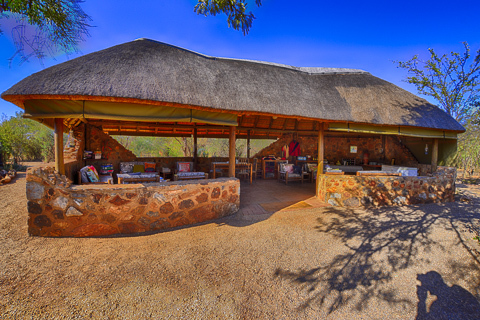 Thanks to Caroline, the kitchen staff, housekeeping staff and the guides; Johnny and Kgomotso - you are all phenomenal and the food was great, overall our Mosetlha Bush Camp experience was simply FABULOUS! 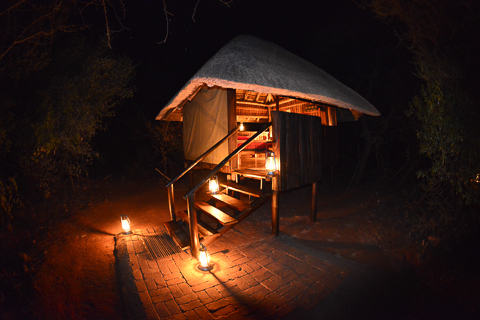 For more information or to book your stay, please visit the Mosetlha Bush Camp & Eco Lodge website.